Homegrown sprouts are quick, easy, meat-free and a highly digestible protein source. Without touching the stove or getting dirty in the garden you can have freshly grown, high fibre sprouts grown on your kitchen bench within days. Grains, seeds, legumes and beans all contain enzymes which lay dormant until they start to sprout. They all contain phytic acid (an organic acid bound to phosphorous) in their outer layer and a variety of naturally occurring toxins that protect them from being eaten by animals in nature. These enzyme inhibitors, phytic acid and other toxins make the dry grain, seed or legume very hard for the body to process and digest. Sprouting neutralizes the phytic acid and enzymes inhibitors allowing for overall better digestion and absorption of acid binding minerals including calcium, magnesium, iron, copper and zinc. Converts gas causing complex carbohydrates into easier to digest sugars. 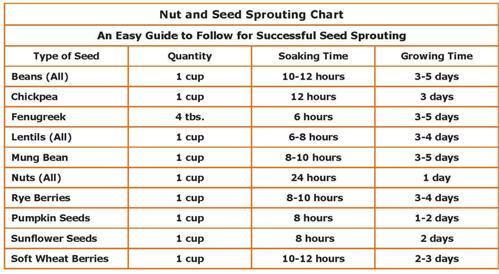 Most seeds and legumes sprout easily. Fresh seeds in good condition sprout the best, if the seed will not sprout it is an indication that it is ‘dead’ and the enzymes are damaged or have been destroyed. It may also indicate the seed has been irradiated, is old, rancid, cooked, sprayed or it is not the whole grain or seed. The easiest things I find to sprout are chickpeas and mung beans but you can sprout just about anything including buckwheat, alfalfa, fenugreek, millet, quinoa, nuts, beans such as kidney, navy, black, lima, adzuki, lentils and peas. Fresh sprouts can be tossed in salads, used to make dips such as sprouted hommus, juiced or added to smoothies. They can also be used in cooking such as stir fry’s and soups and take less time to cook. All you need to grow your own sprouts is a clean regular or wide mouthed steralised jar and a mesh screen to cover the jar opening or you can use a sieve (anything that allows water to pass through). You can buy regular seeds, grains or legumes at most supermarkets or Heath food stores. Pick through and discard any broken, mouldy, discoloured or disfigured seeds as they main contain harmful toxins. Strain them after the appropriate soak time and watch them grow. Harvest. 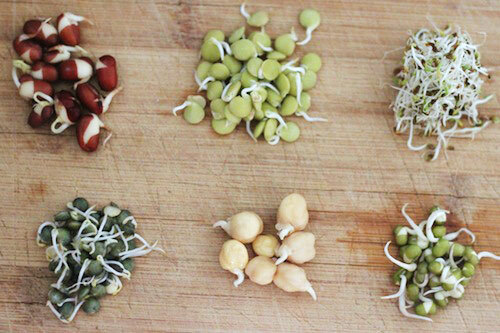 Transfer dry sprouts to a cleaner or container and store in fridge for up to one week. If the sprouts aren’t completely dry they can become moldy, in which case they should be thrown out. If the seeds are damp when storing, set them on paper towel in a container. Remove paper next day.